Lieutenant Governor Nancy Wyman addresses party faithful with State Comptroller Kevin Lembo in background. At right, State Senate candidate Marilyn Moore. 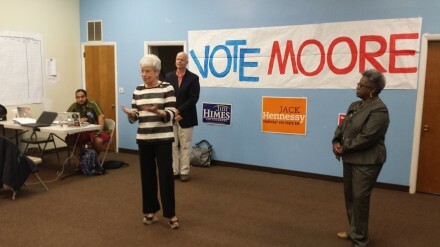 “We all have to do this together,” Wyman implored local Democrats at headquarters on Wood Avenue. 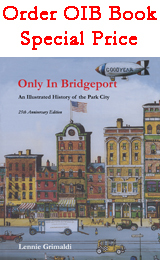 “Bridgeport is very important to us. Please get out and work as hard as you can.” She added “The real Tom Foley” is not in touch with the real problems facing everyday people. Foley, spending more time in cities this cycle than his 2010 run for governor, says he has an urban agenda, but has not yet shared many specifics beyond a call for urban enterprise zones. Polls show a tight race for governor. 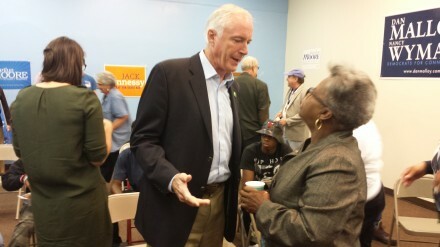 Mayor Bill Finch chats with Marilyn Moore. Moore’s campaign message focuses on serving as a bridge builder in the city-suburban 22nd District that covers Trumbull and portions of Bridgeport and Monroe. She faces Trumbull Town Councilman Rick Costantini, who also has roots in Bridgeport, in the general election. This photo is certainly a keeper. 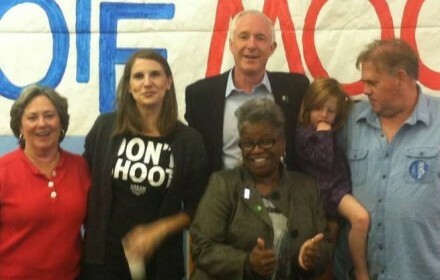 From left Mary-Jane Foster, Lindsay Farrell, executive director of Connecticut Working Families Party, Mayor Finch, Tom Swan, executive director of Connecticut Citizens Action Group holding daughter. Fronting Finch, Marilyn Moore. Hmmm, wonder if this will convert into a holiday card? A diverse mix of party advocates attended, some who have not always worked together but apparently coming together for this moment in time. Mayor Bill Finch, former Mayor John Fabrizi who’s formed an exploratory run for mayor and Finch’s 2011 primary opponent Mary-Jane Foster were in attendance. While Finch supported incumbent Musto in the primary, Fabrizi and Foster backed Moore. After the speaking was done Finch stayed around to chat with the party faithful including an extensive conversation with Moore who hopes to join the city’s eight-member legislative delegation in Hartford led by State Senator Andres Ayala. What happens during the legislative process in Hartford hugely impacts the city budget. Had breakfast next door to Moore HQ this morning and saw many of the Democratic celebrities you mention, Lennie. I stopped to talk to some young City canvassers for Himes encouraging them to register to vote as soon as they are 18, and use every primary and election thereafter as a civic obligation like paying taxes. Comptroller Kevin Lembo passed by in the meantime. I have spoken with him and his attempt to support OPEN, ACCOUNTABLE and TRANSPARENT governance on the State website. 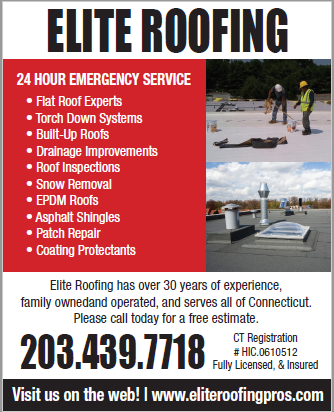 Did you happen to see whether Kevin and Bill Finch had a photo op while discussing the ways Bridgeport differs in providing good info, well formatted, in a timely fashion? Time will tell. 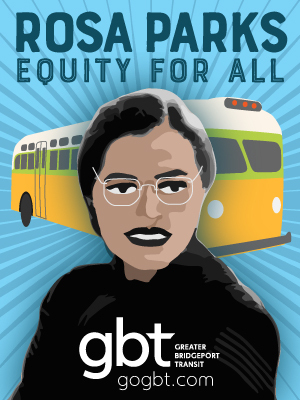 Collective bargaining rights are for union members who lack individual bargaining abilities. Our CT state legislature is solidly blue–unlike Wisconsin’s. From 1992-2013, Connecticut state house, senate, and governor: unified GOP majority: 0 years out of 20 years; GOP Governor w/ a GOP majority in at least one chamber of state legislature: ’95-’96: 2 years out of 20. Both chambers of legislature majority Democrat: 18 years out of 20. For the same period, Wisconsin state house, senate, and governor: unified GOP majority in ’95, ’98, 2011-2013: 5 years out of 20 years; GOP Governor with a GOP majority in at least one chamber of state legislature: ’93-2006, 2011-2013: 17 years out of 20. Both chambers of legislature majority Democrat: 3 years out of 20. Exactly, Pete. Wyman needs to stop “whining.” Malloy is heavily supported by ConnCAN, Northeast Charter Schools, Families for Ex-$ell-ent Scammers, Ex$ell Bridgeport, etc. Let’s not pretend Malloy is better on charter schools than Foley. Funding charter schools does ABSOLUTELY nothing to save money, nothing. 1) A conservative Republican Governor can still do a lot of damage. Especially if he brings along the constitutional officers. 2) A conservative Republican Governor can do a lot administratively to expand charter schools especially when they whisper up on Hartford we will only do it in the poor urban areas because it does save us money. 3) A conservative Republican Governor is not going to help the state’s urban center. Is Foley still working on his urban agenda? Wisconsin’s electorate was red enough to return its once-removed Governor to office. The Truth is colorblind and disrespects the legislature’s party affiliation. In addition, I’m prepared to outperform Bob Walsh’s role in Dan Malloy’s re-election bid. Is he up to the challenge? 2) Republican-leaning Trumbull and Monroe are VERY pissed at Moore over her “we’re bringing this seat back to Bridgeport” crack after winning the primary. She needs to mend fences … FAST … in Trumbull and Monroe if she wants to win in November. First of all “We’re bringing this seat back to Bridgeport” was not what Moore said. What she DID say was “We are taking back what belongs to Bridgeport” after Ed Gomes spoke regarding the Gerrymandering that was done to take Cross and Park City out of his district and give it to Musto. That move was made to keep Musto in the seat. Her comment was in reference to the Gerrymandering and how the folks at Cross and Park City voted for Moore instead of Musto. The gerrymandering took Bridgeport votes and handed them to Musto. Ed Gomes was defeated partly due to that move as well. 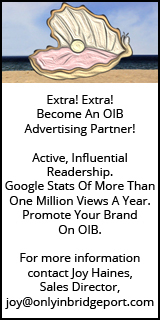 The Post cut out a snippet, and used it however they wanted to. You’re talking gibberish. Your gal won. Move on. That picture is certainly a keeper!!! Who took it? It looks like a new spin off “Modern Family,” seriously! Good luck to Marilyn Moore. Steve, you are not kidding. I received an email from a Black Rock resident and they were HOT! This person said they were taking Marilyn Moore’s “sticker” off their car and wished they had not donated to her campaign. If you want to have any level of credibility, you cannot portray yourself as anti-machine or anti-Mayor Grinch and then pose for photo-ops with him. I sent the link to 85 of my Bridgeport contacts highlighting her remarks about how important it is to reelect Malloy. Here is Marilyn Moore speaking at a rally on March 6, 2012 regarding the CT Supreme Court ruling on the illegal takeover of the BBOE. She starts speaking about five minutes in and she specifically states someone actually said “democracy is not for all, do not send them back.” Yet here is Marilyn Moore taking photos with Mayor Finch, the very same person who made the very remarks she was referring to during this rally. Governor Malloy worked hand-in-hand with Mayor Finch to execute this coup and now it is so important to make sure Malloy is reelected. Pure hypocrisy, or typical behavior for a politician? You be the judge. I think you may have misinterpreted my simple post. I was actually wishing Moore good luck. I did like the picture and it did look like a potential of a new show–a spin-off of Modern Family. Seriously, look at the pic. A single man with a kid. a mixed marriage (Finch and Moore) and a Lesbian couple. I am of course kidding. But I did like the pic and they all look happy and that’s a good thing. I give credit to Finch for doing the right thing twice this week. Going to UB and showing party unity. To the chagrin of everyone on this blog, Finch does have a lot of supporters and they will vote accordingly. It is called politics. Mary-Jane Foster looks happy, but then again she was an actress. 🙂 No matter how you slice it Maria, this was a good pic. They all look terrific and Marilyn Moore is no fool and neither is Bill Finch. I am still trying to figure out if Foster will be endorsed by Fabrizi or Fabrizi endorsed by Foster. I cannot see any of them supporting Finch and that will not be a surprise to anyone. I’d wait for six months since nobody in Bridgeport is even talking about this. Steve, I didn’t misinterpret your remarks regarding wishing Marilyn Moore good luck. My comments were related to the comment regarding the picture being a keeper. I guess Marilyn was doing something like this. Looking up from a plate of penne and meatballs, Pereira tells Foley that she voted for him four years ago, even though she was a leader of the local Working Families Party at the time. Lifelong Bpt, sorry, not getting your point. Bob Walsh, you have your experiences, wits, and wisdom to judge by. I respect that. Even so, the WI-CT comparison is a red herring. Just riling up the party faithful? In the Sept 10, 2014 Q poll: 53 percent of respondents disapprove of the job Malloy has been doing; 40 percent approve. Will anti-Malloy sentiment throughout CT prove stronger than anti-Foley arguments tying him to anti-Scott Walker sentiment in CT? My best guess: Yes. Will he support a bill like State Reps Grogins and Hennessy’s HB 5724? Marilyn Moore has said repeatedly she will. BTW: Mr. Costantini, her competitor, walked around Black Rock yesterday. He spoke with my wife (a big Moore supporter). From what my wife indicated, Mr. Costantini’s main thrust was if you don’t like conflict-of-interest in Bridgeport, then vote out Malloy and vote for Costantini. Costantini also said he’s a charter school supporter because he believes in choice; but, it seemed, only in Bridgeport, not for kids in his town. Not sure of this. Machiavelli’s battle cry: Part of the political ethic involves correctly identifying the competition. Both candidates have identical positions on an issue of interest to all voters in the 22nd district. Tom Mahuffa for Mayor! Everybody likes Tom!